Practicing for his upcoming state of the union speech in front of teachers and students at a community college in Winston-Salem, Virginia, U.S. President Obama called Monday for more spending on education, innovation and infrastructure to ensure a future where America does not lag behind other countries. It was time for an American “Sputnik moment,” he said. For those of you who are too young to know, or too old to remember, “Sputnik” was the very first Earth-orbiting artificial satellite. The problem was that it was launched by the soviets in 1957, which drove our southern neighbors nuts. The event ignited the Space Race within the Cold War, and to the delight of US scientists and engineers, zillions of government dollars started to flow towards technological development and scientific research. 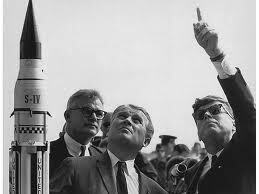 What is remarkable is that the US federal government did not just inflate the research grants of the scientists and engineers who were directly involved in the space program, but the National Defense Education Act of 1958 — focused the federal government’s attention and resources like never before on improving the quality of science and language education in general and on getting more students into college. “We need a commitment to innovation we haven’t seen since President Kennedy challenged us to go to the moon,” Obama said. He is expected to be more specific as to what his government is planning to do, in his state of the union address, but he is already talking about meeting his “Sputnik moment” by fostering curiosity and innovation through such steps as providing a bigger, permanent tax credit to companies for research and development. When will the groveling stop, Mr. President? It is not a coincidence that his Nobel-prized Energy Secretary, Steven Chu is also talking about a “new Sputnik” moment. In his case, it was triggered by the success of China and other countries in clean energy industries. What would it take for Canada to start fearing a future where it is lagging behind other countries?